A command menu pops up when you right click on a file, enabling you to manage the document. 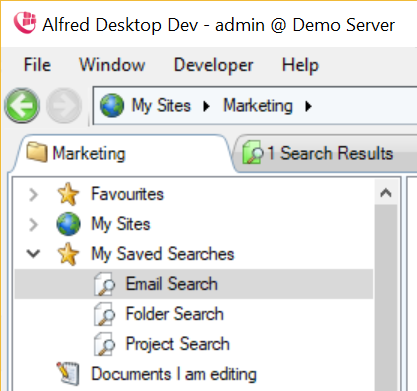 Files can be opened directly within Alfred Desktop by clicking the “Open” command or by double clicking the file. The file will be downloaded to a local copy and opened with the corresponding application. By using the drag and drop feature, you can move files to any location in the tree, if you have the appropriate rights to execute a move. You will need, at a minimum, file creation rights in the receiving folder and file deletion rights in the originating parent folder. Copying files in Alfred Desktop will make a copy on the desktop clipboard. You can paste the document to any application on your desktop. Another method of copying files is to drag and drop from the Alfred Desktop window onto another application window (e.g., Explorer, Word document, or an e-mail). 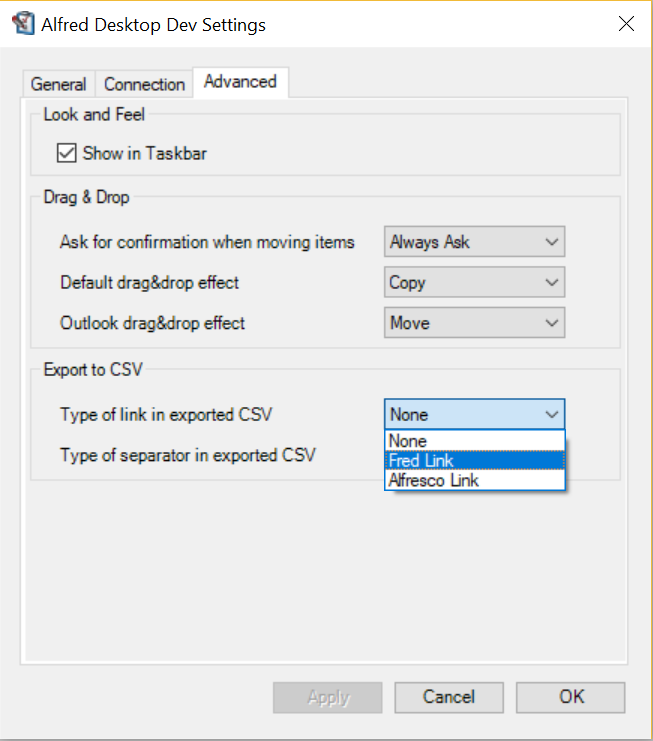 Provided that the recipients have access to the Alfresco repository, it is more appropriate to refrain from copying the file into an e-mail communication, but instead, inserting a link to the document using “Copy Link address”, by right clicking on the file. This avoids the duplication of identical information within the organization. 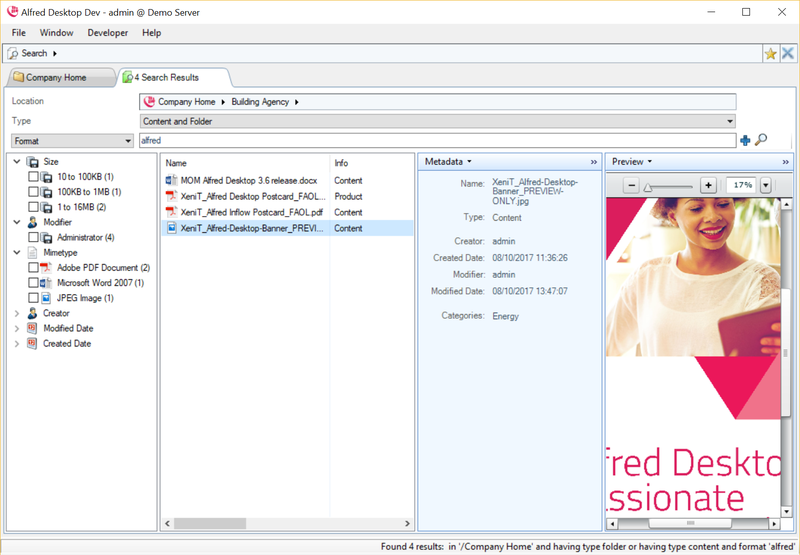 This action copies a link which will open a new tab in the Alfred Desktop application, with the folder highlighted in the Details pane. “Mail as Attachment” allows you to send a document as an attachment to an email, directly from Alfred Desktop. The document will automatically appear as an attachment in a new email. 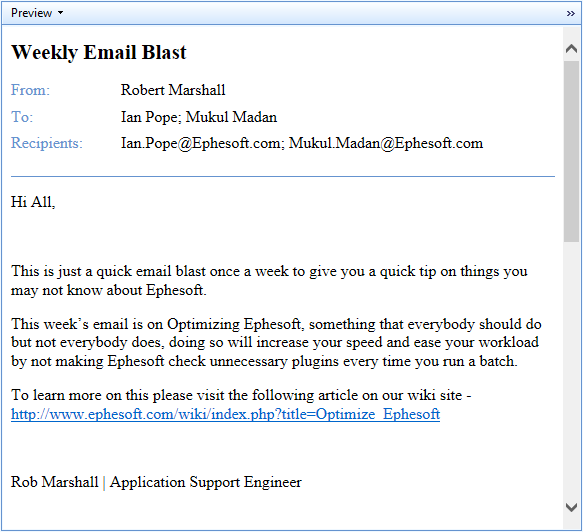 “Mail as Link” allows you to mail a link to a certain file or folder in Alfred Desktop. 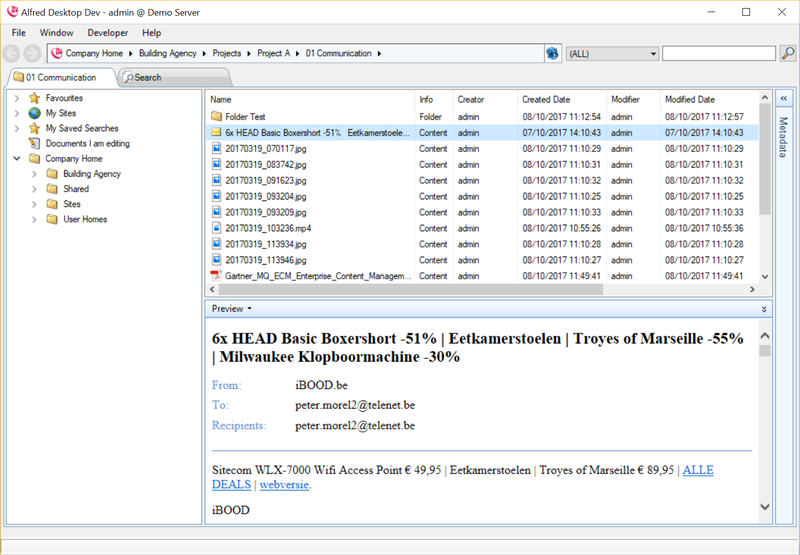 Provided the receiving party has access rights, clicking the link will open the Alfresco Browser and show the file/folder and its contents. By using this feature, you will avoid duplication of documents across the organization. To rename a file, click “Rename”. Or push the F2 key. Or click once on the highlighted file. Enter the new name of the file and press Enter. To delete a file, click “Delete” . If you do not have the appropriate rights, this command will be disabled. You can delete multiple files by selecting the relevant ones before clicking the “Delete” button. You are able to restore a file by clicking on “Window/Recycle Bin”. See Recycle bin. The metadata in the columns in the Details pane or in the Metadata pane, are metadata of the specific time you visited the content. If another user has updated the metadata, this will be updated in your view the next time you refresh the folder content (see Refresh) or in the Metadata pane when you reselect the document. You can enforce a refresh of the metadata by clicking “Refresh” or F5 on the folder or the file. Locking a document will prevent others uploading new versions of the document, although users will still be able to preview and download the document. Check-in: when you have finished the modifications on the document, you can check-in the document as the “original document”. This will update the original document, remove the “Working Copy”, and unlock the original document. The document becomes available for modification by other users. The “Edit Offline” command combines a check-out and download / opening of the working copy. The working copy is copied to an Alfred Desktop folder on your local hard drive. This folder is defined in the settings (repository tab) of Alfred Desktop. After editing the document, you can save the local working copy of the document without selecting the location you are saving the document to. If you want to continue working on the working copy after you have closed the local copy, you can reopen the local copy by double clicking the working copy in Alfred Desktop or by clicking the “Open” command. 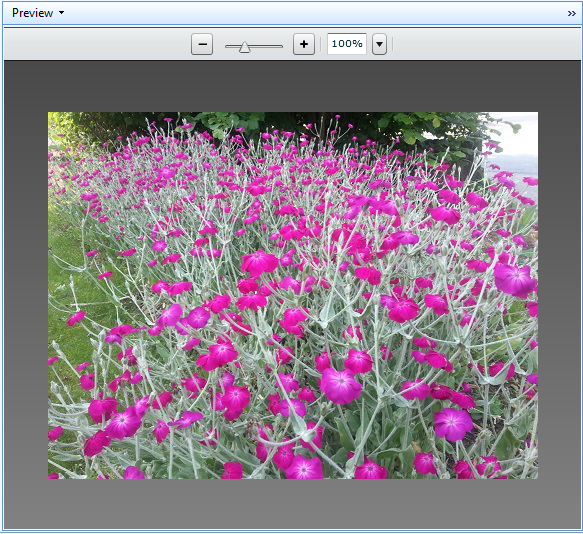 You do not need to drag and drop or upload the working copy to Alfred Desktop. With the “Discard Changes” command, you will be able to unlock the main document and remove the working copy, including deleting any changes you have applied to the document. The “Edit Online” feature lets you edit your document without first saving it offline (checking it out). This functionality is only available for MS Word, MS Excel and MS PowerPoint. 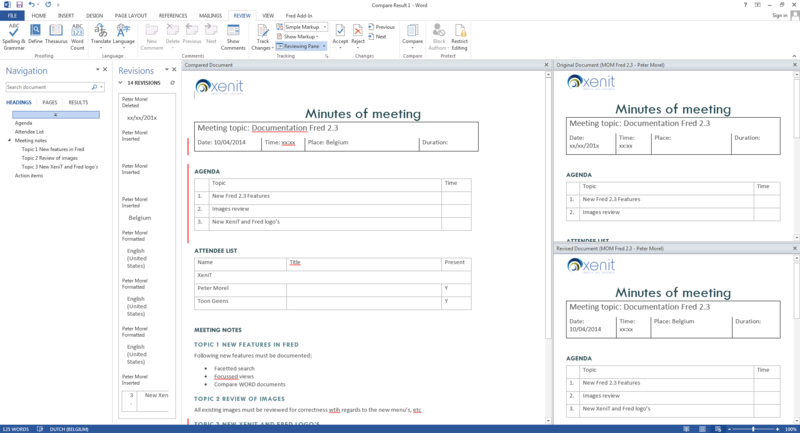 The behavior of the edit online feature varies slightly across the multiple versions of Office and whether you have Single-Sign-One. Below is a description on the behavior when using Office 2013. Clicking the “Edit Online” option will open the document. Note: a warning box might appear prompting you to be sure the content can be trusted. Click OK to open the document. Note: if prompted for login credentials, type your user name and password, then click OK. With Single-Sign-On, you can avoid having to enter your user name and password. Contact your system administrator to arrange enabling of the Single-Sign-On feature. The document opens in a separate window. In the library, refresh the page to see the lock icon associated with the file, confirming other users are unable to edit the document. Important: If the file opens in Read-Only format, contact your system administrator. As soon as you have clicked the Enable Editing button in Word, or you start editing the document, an invisible check-out action ensures your document remains protected, or locked, in the library during the editing session. When you finish editing, the document is invisibly checked in, with the updated version available to other users. 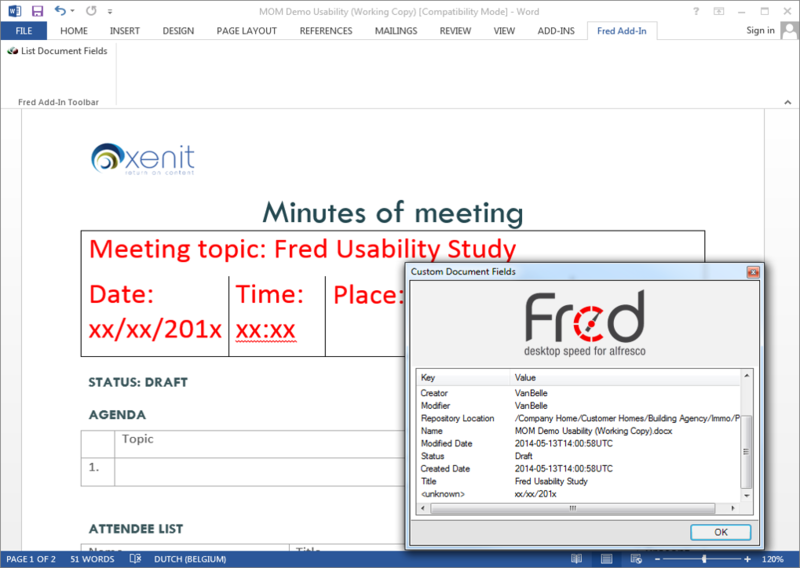 Alfred Desktop enables you to write Alfresco metadata values to metadata fields in Office documents (such as MS Office, Open Office). Changing metadata values in Alfresco will change the value in the related metadata field in the document. A prerequisite of this function is that the naming of the metadata field in the document template is the same as in the Alfresco document model. 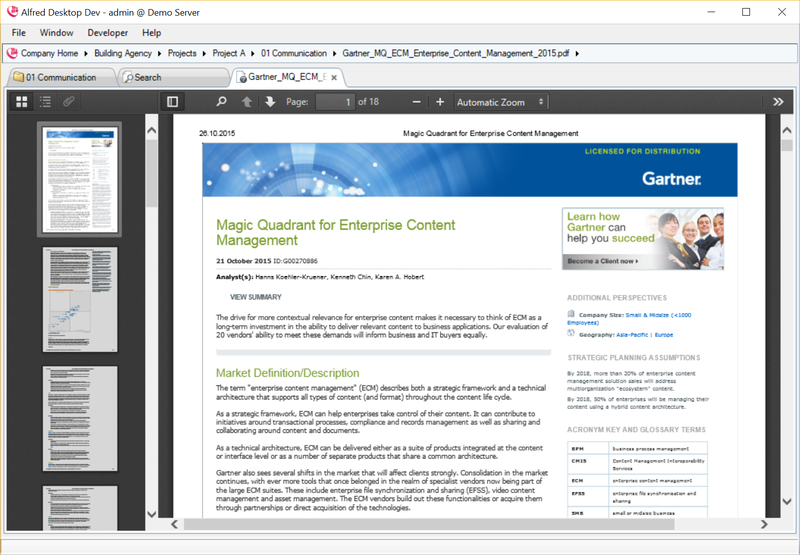 You can create a document template that uses metadata fields to create the content. 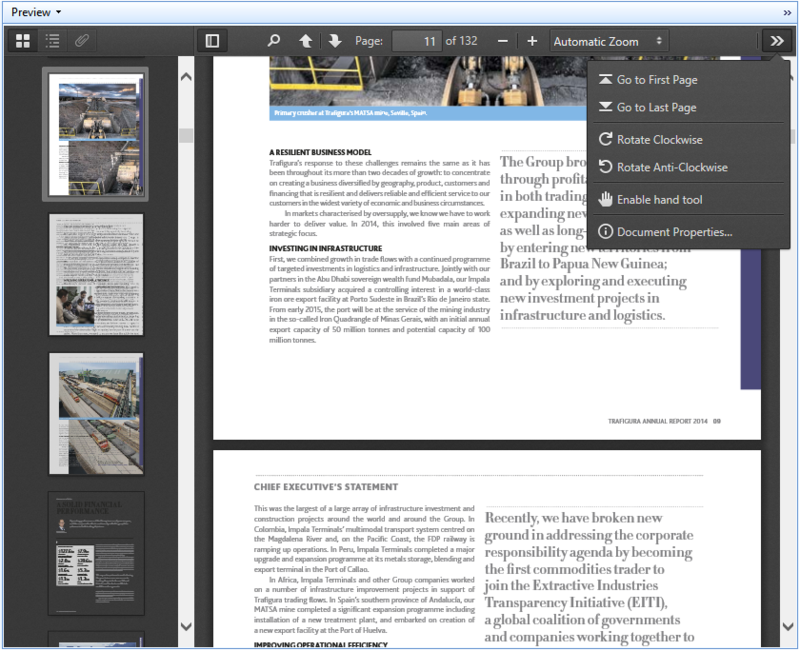 Using the above-described mechanism, you can further automate/assist the creation of documents. Some examples of applying this feature are: creation of a corporate document reference number, meeting date, meeting subject. Contact your system administrator to configure this functionality. The Convert to PDF command is available for MS Office documents and converts the document into a PDF version using the MS Office application on your desktop. 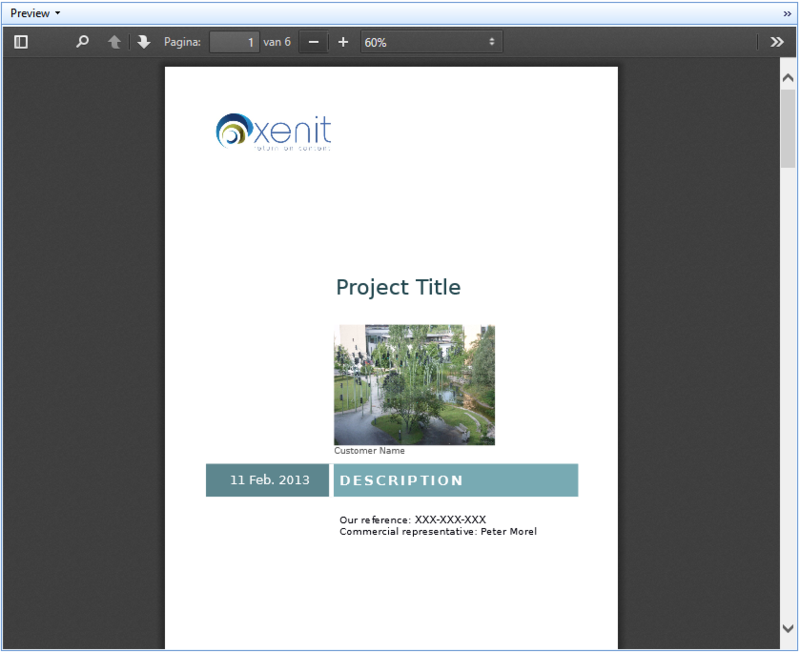 A PDF version of the document is made available on Alfresco in the same folder. 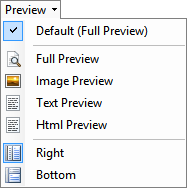 The system administrator can choose the default preview, per document type. When browsing through a list of documents, you will have a default preview of that document displayed. The enhanced preview feature provided by Alfresco enables you to: search text within the preview of MS Office and pdf documents, select and copy text, and enjoy other useful features. Within the navigation tab and the search tab, you can configure the preview to display at the right or at the bottom of the Details pane. Clicking “Preview” in the file menu will open the preview of the document in a separate tab. This command will not be enabled when a preview of a document is unavailable. 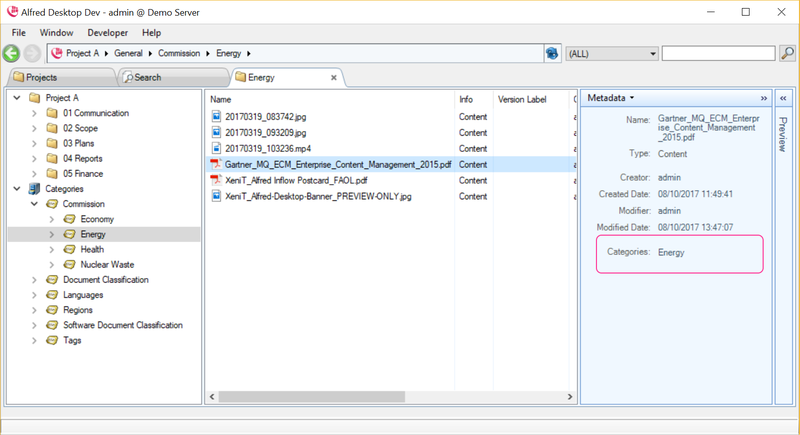 Contact your system administrator to enable previews for specific document types in Alfresco. 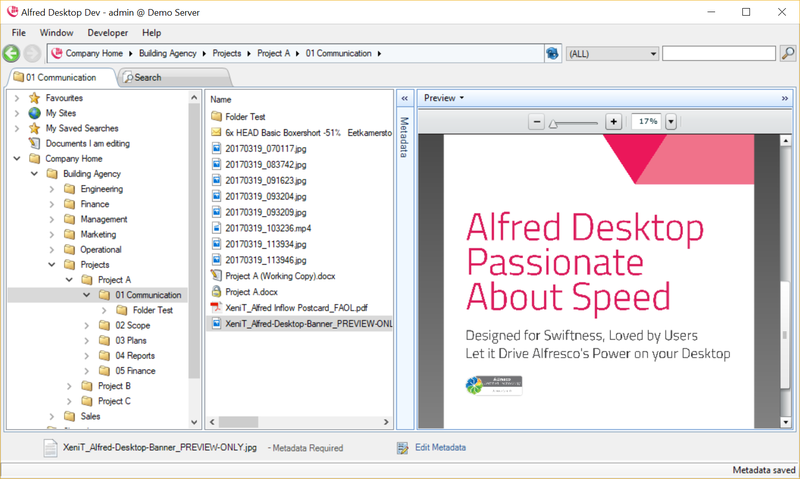 Versioning of a document can be activated through the Alfred Desktop interface. By default, a document is not versioned in the Alfresco repository. When uploading the same document (same name) you will be asked to upload a new version or to cancel uploading. You can specify if the new version is a minor or major version, and provide comments about the new version. 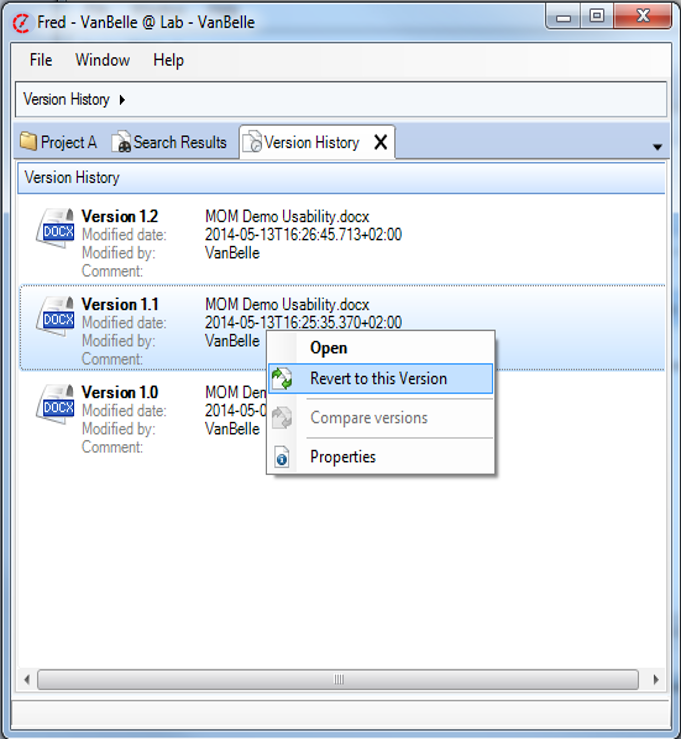 Once a document is made “versioned”, the command “Show Version History” is enabled. Upon selecting this command, a list of all versions of the document will be displayed. Every version can be opened individually. You cannot upload documents to this list. You can revert an older version of the document to the most recent version. This will create a new version. You can compare two versions of a Word document. 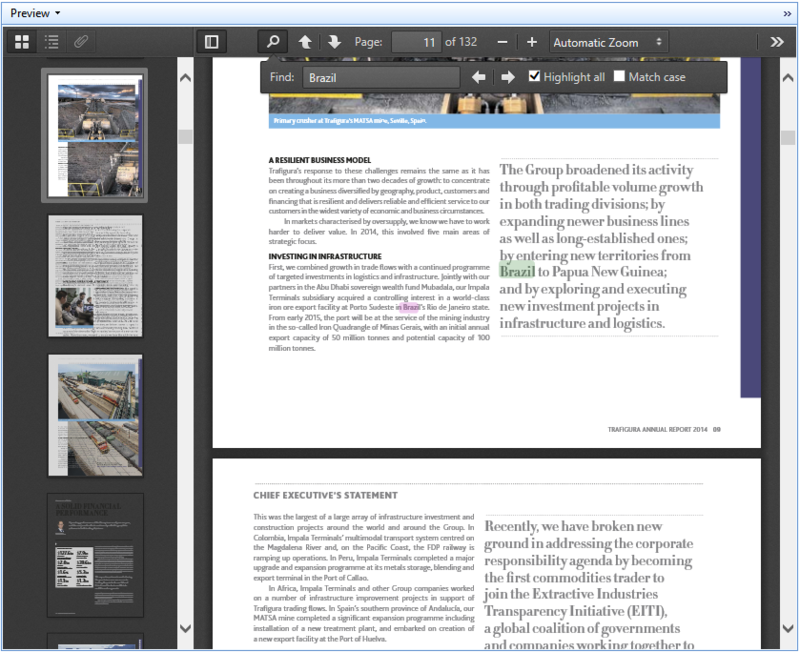 When selecting two versions of a specific Word document, the “Compare Versions” command will be enabled. 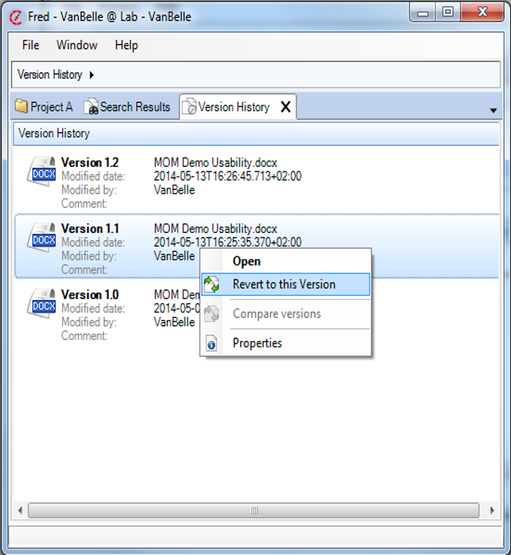 The “Compare Versions” command will download both versions, and use the Word application on your desktop to compare the two versions. 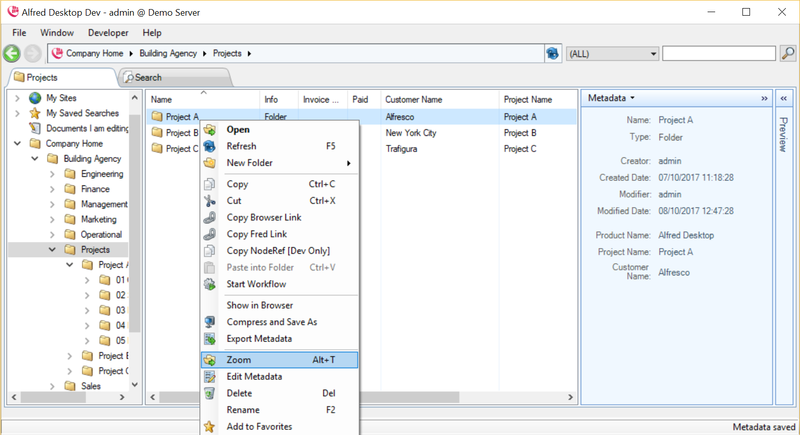 The “Show in Browser” command enables you to jump from the Alfred Desktop window to the Alfresco Web Interface. 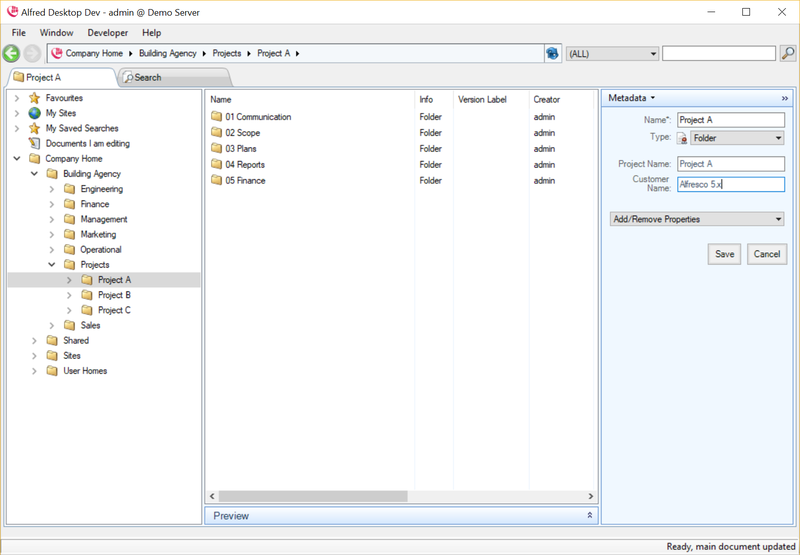 This allows you to view more file details, and use all functionalities available in Alfresco. Similar to Folder permissions, you can read and set permissions on files. See ‘Folder permissions’ for more information. Some commands in the File menu are available when you select multiple folders. You can view the metadata linked to a folder in the Metadata pane. 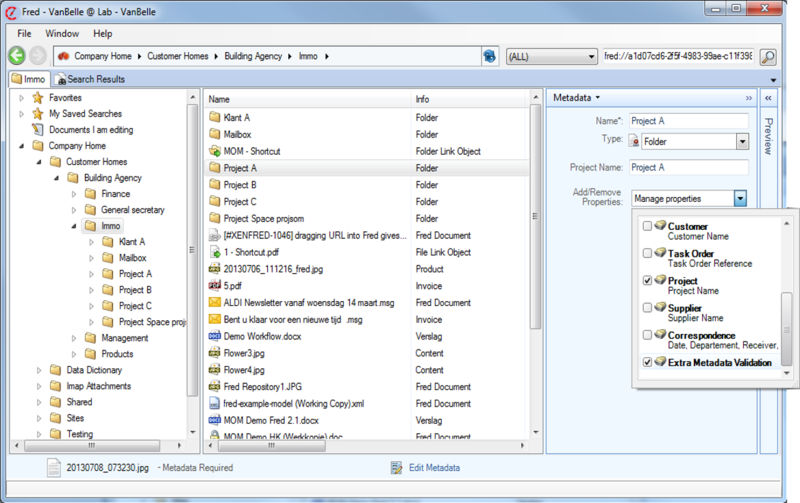 The metadata appears when you select a folder in the Navigation pane or in the Details pane. 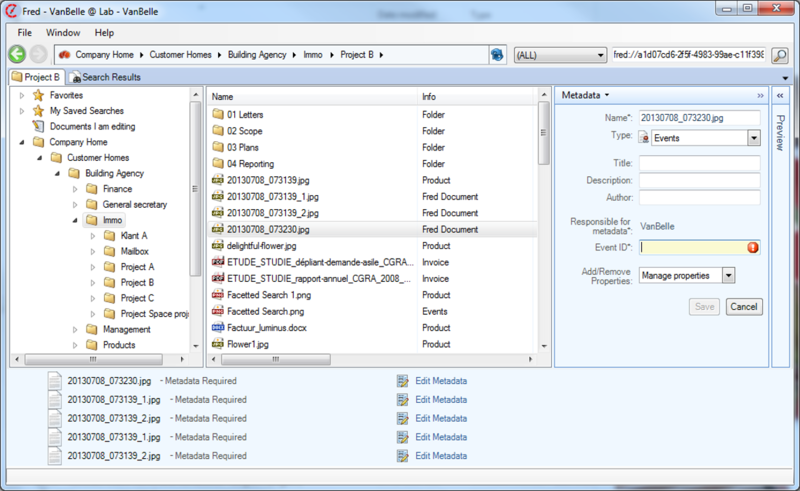 To edit the metadata fields of a folder, click “Edit Metadata” in the Metadata pane. 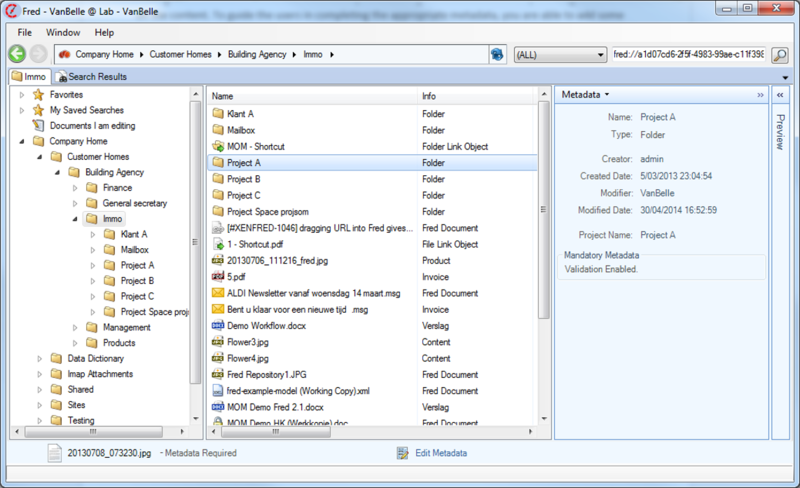 Metadata of files and folders are presented in the Metadata pane. As you scroll through the list, data in the Metadata pane will be updated. In the example above, you will see that this document type is a “Project”, which has the standard metadata field (creation date, creator, etc.) and some specific metadata fields (project name, customer name, etc.). “Edit Metadata” will open a window to edit the metadata field values. You can perform edits such as adding further detail to the document type and / or adding additional optional metadata groups. These steps are described in ‘Uploading file’. Category fields: the category picker includes a filter. When the Alfresco server is using SOLR indexing, you can activate the text metadata field to enable auto completion behavior. Then, while you are typing, Alfred Desktop will suggest possible values that fit the text you are typing. As you narrow down the options whilst continuing to type, you can select, with either the mouse or with the keyboard arrows, the correct value, and move to the next field. Auto suggestion is case sensitive! When you add a new value to the file, it will take some time before this value appears in the suggestions. The delay is dependent on multiple elements specific to your environment. In ideal conditions, the delay will be no more than 15 seconds. 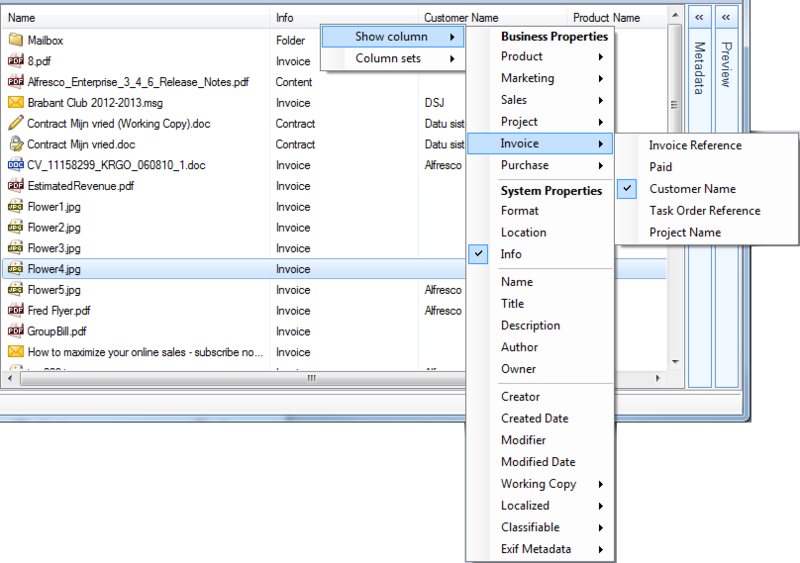 All metadata fields, as defined in the Alfresco document model, can be selected as a column in the Alfred Desktop window. This allows you to sort the files. See “*Handling views*” for more information. When clicking the checkbox, it will iterate between , and . This is indicating that your input will result in a new value or , for that field, or that you want to leave the different values in the document selection unchanged. 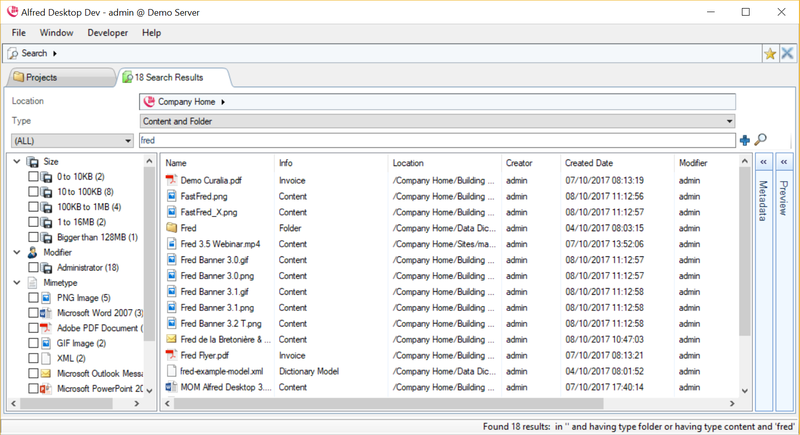 In the Detail pane and the Search pane, you can export the metadata of selected objects and save them to a comma separate file on your local drive. The metadata of the columns that you selected in the view will be exported to a local file. You can now add additional records to the list by selecting new objects and using the shortcut CTRL + C or the COPY command to copy the metadata to the desktop clipboard. You can then paste the metadata values to an Excel table. When uploading documents to the server, standard document properties are extracted automatically from the document and you are able to edit the business metadata. You can choose to keep the default document type, and not add extra metadata. Adding extra metadata fields and values is helpful in finding the content at a later date, and providing additional details of the content. 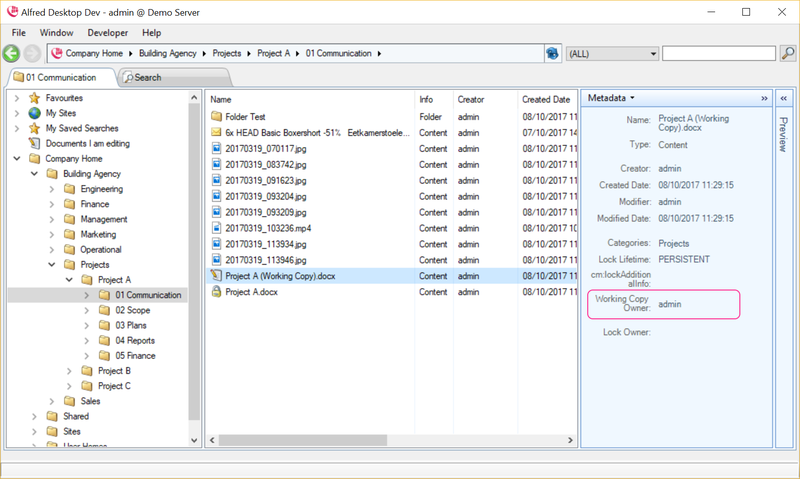 To guide users in completing the appropriate metadata, you are able to add some additional metadata governance in specific folder structures. This functionality needs to be properly configured on your server. Contact your system administrator for configuration services. 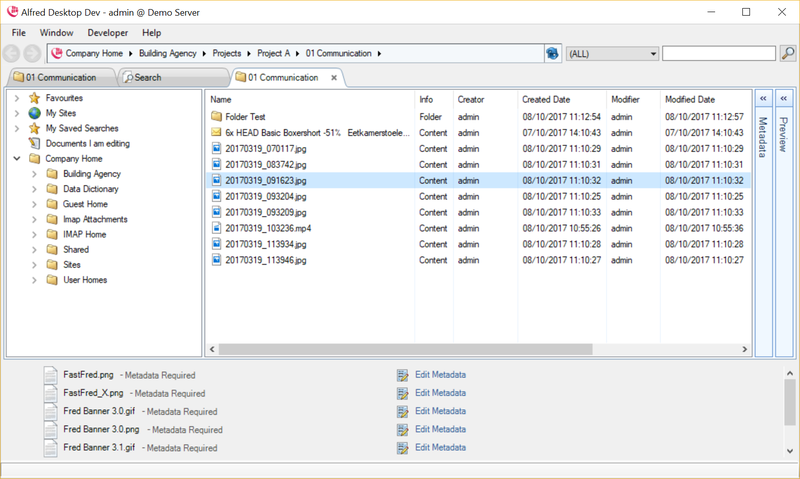 You can activate the mandatory metadata governance on a specific folder and its subfolders by adding the Enable Metadata Aspect to the folder. 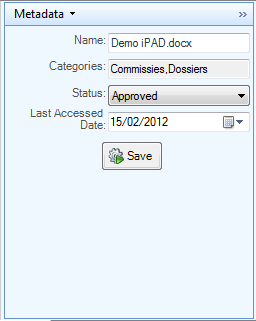 The metadata panel of the folder indicates whether the Metadata Validation is activated, as shown below. If you are uploading too many documents with metadata that do not pass the validation check, you will be restricted from adding additional documents to the repository. The parameter for the number of ‘invalid’ documents permitted is set on the server. The document type cannot be generic (e.g. Alfred Desktop Document, Company Document) and must be specifies (e.g. Invoice, Project, Minutes of Meeting). The list of document types that are considered ‘generic’ are defined on the server. For document types that contain mandatory metadata fields (indicated by a * next to the description), the fields must be completed with the appropriate values. When documents are uploaded into folders where automated rules are changing the document type and/or the metadata values, the validation check will run against the values after the rule has been executed. If the validation is positive, the document record will be removed from the upload pane after you have save the metadata. When other users complete the metadata, the validation check will be positive and the document record will be removed from the upload list. Alfred Desktop includes the possibility of connecting to a metadata database or table, in which it can query metadata values linked to a record key (i.e. customer ID stored in Alfresco metadata field) in the database and display these values in presentation fields in the Alfred Desktop User Interface. For more information, contact your IT team. In the Browse pane and the Search pane, you can add columns to be viewed by a right mouse click on one of the existing column headers, and selecting “Show Column”. In that list you can select or deselect the field you want display in a column or hide a particular column. The list of fields is the summary of all metadata fields in all document types defined by your organization. You can modify the width of the column by dragging the edge of the column header. Note that these modifications will be saved as the default view when you open Alfred Desktop at a later date. 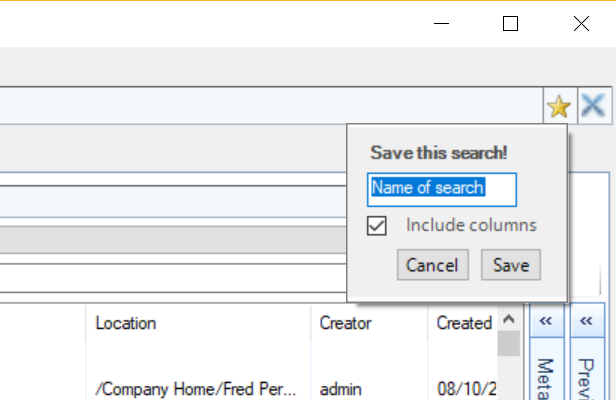 In the Browse and Search panes, you can change your column view; Alfred Desktop allows the selection of a predefined or custom defined set of columns. The predefined column sets are the document types defined in the Alfresco document model. 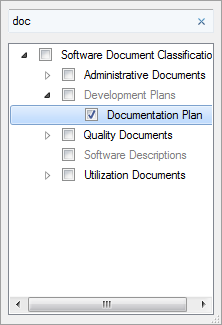 Selecting one of these document types will show all metadata fields related to this document type in the columns. You can select the individual columns you want to add in your custom view. This view will be set as the actual view and will be maintained when closing and reopening the repository. You can select a specific set of columns and save this view with the “Save Current Columns” option. You will be prompted to provide a Column set name. 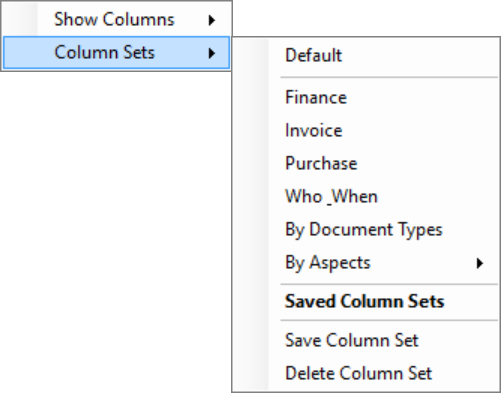 This column set will then be available under “Saved Column Sets”. 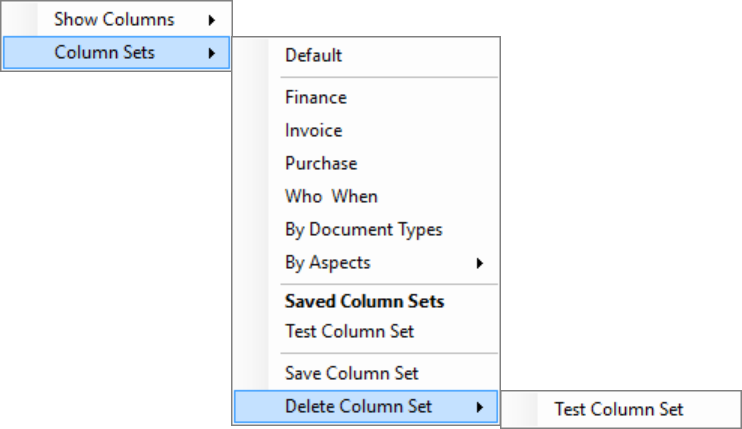 You can remove the custom column set by using the “Delete Column Sets” command. Clicking on the column header will sort the files by alphanumeric values within the folder. The Zoom function provides alternative and extended navigation functionality in a subpart of the folder structure. It is mainly used to provide a different view of the content in, for example, a project folder. Initially, Zoom provides an extra navigation structure, based on the Category structure, as defined on your Alfresco server. Select the folder and click on Zoom. 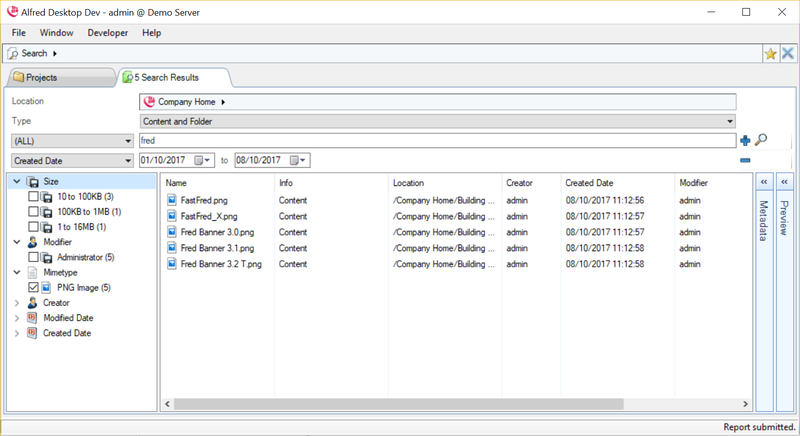 A separate tab will open where the selected folder will become the root folder and the sub folder structure is presented. All navigation and document functionality is available, provided you have permissions in this sub structure. The category structure is presented as an additional navigation structure. 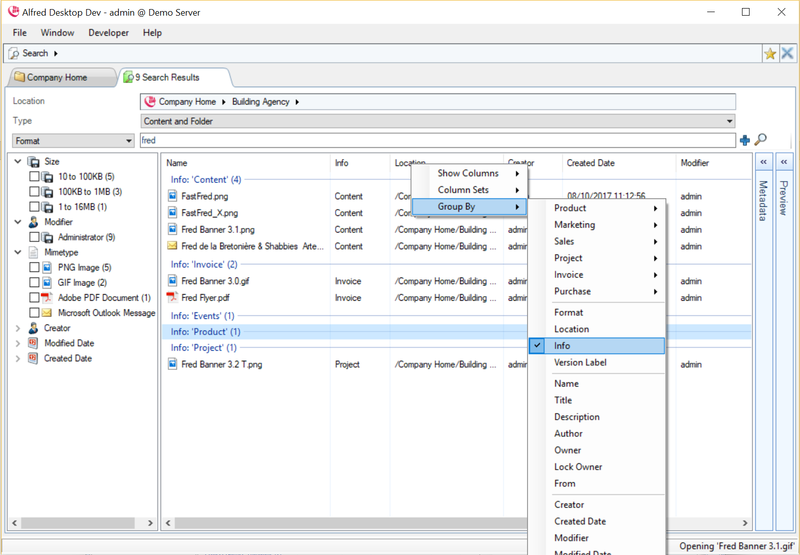 Selecting a folder will filter the content in the above folder structure and present the list in the Details pane. In the example below, selecting Commission will present all documents for project A, which have been tagged with the categories ‘Commissions’, ‘Energy’ and ‘SME’. You can upload documents into a specific folder in the Zoom tab. You cannot upload documents when you are navigating in the Category structure, as this does not indicate the folder in which you wish to upload the document. 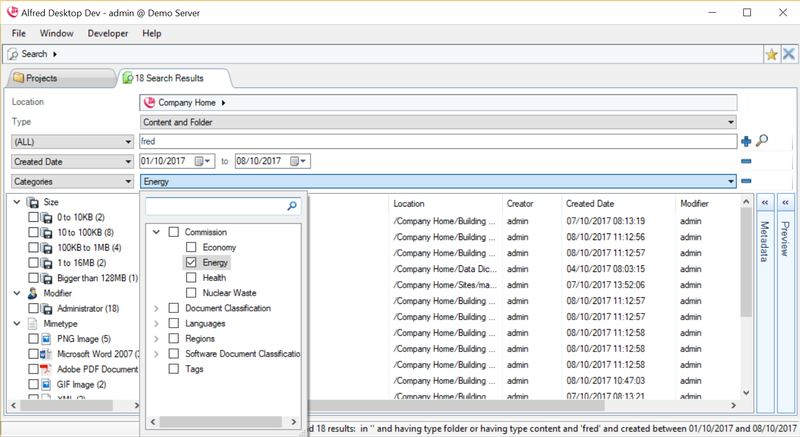 A Virtual folder is a filtered view on a part of the document repository. 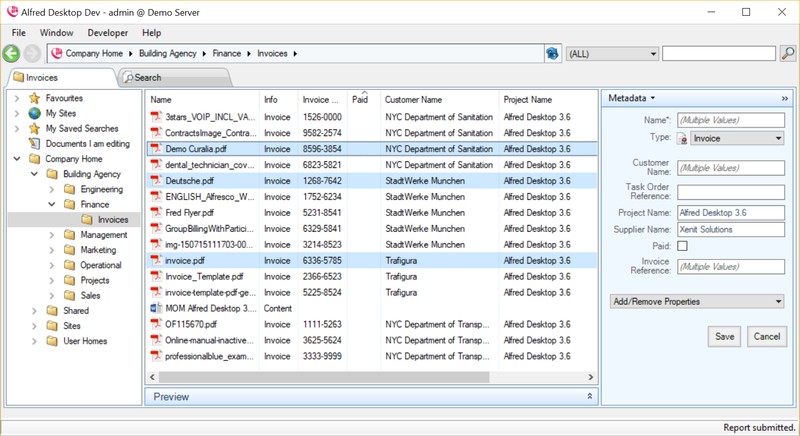 It allows you to create a virtual folder structure based on filtered views on the repository. Below is an example of views defined for an invoice approval process. The views are defined in configuration files in the Data dictionary. 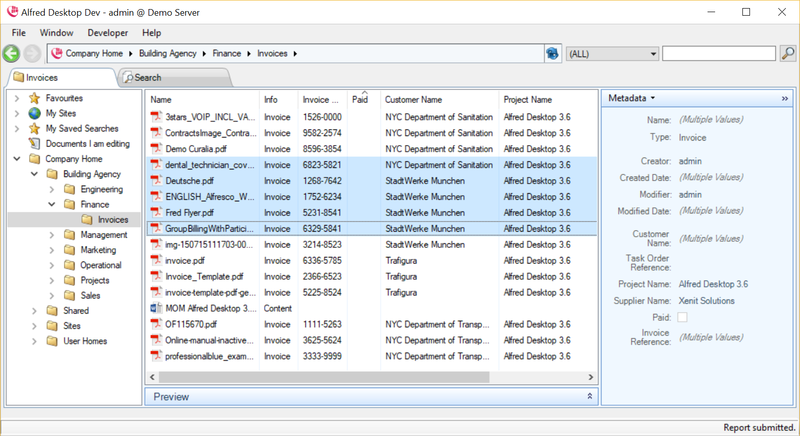 For each folder, you can define the filter, the folder icon, the columns, etc. Your system administrator can configure Virtual Views. 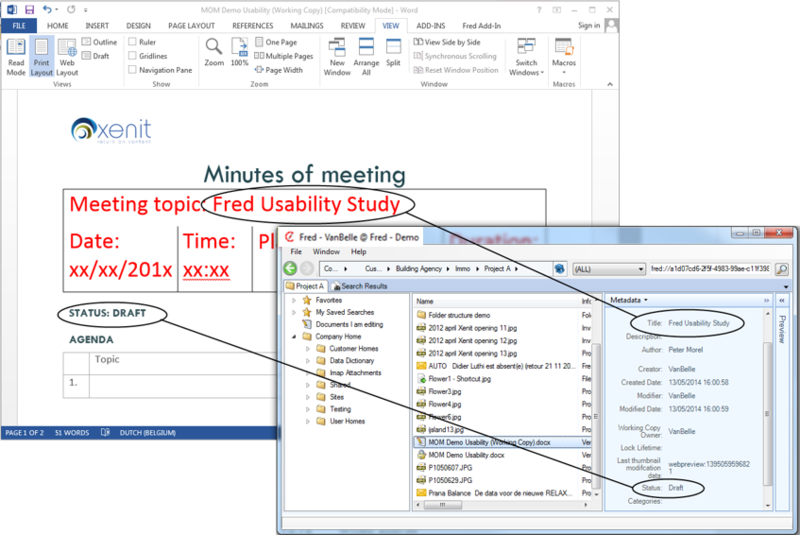 At the top of the Alfred Desktop Window you are able to type in text relevant to a document or topic you are looking for. The search will look for the text in any metadata field and in the text of the document if it is text-searchable. The search will be restricted to the folder set in the breadcrumb and its subfolders. If you select a metadata field, the search will be restricted to this metadata field. If you select “Full Text”, the search will be restricted to searchable content. Use wildcards before and / or after the word (e.g. *health*) when you are looking for that text in a part of a metadata field, document, etc. The search result will be presented in a separate tab as a list view, and show all available field values of the selected columns. You can select the column set you want to see, and the list can be sorted by clicking on the column header. Your system administrator can configure a default search field. If you have received an Alfresco or Alfred Desktop link to an object, you will be able to copy and paste it into the Search field. The object will appear in the search result. A simple search can be extended to an advanced search. To add or delete search criteria, click on . If you wish to refine your search, you can add as many metadata fields as you want. Click on the to execute the search. Where SOLR indexing has been activated on the Alfresco Server, you will receive additional filtering functionality in the search result. On the left side of the search result, a list of facets and the values present in the found records will be presented. The facets appearing in the left column are predefined by your organization. Contact your IT team if you require additional fields to be made in this list to optimize your search. For each facet defined in the search pane, a list of values that appear in your search result, and the number of records containing that value, are presented. 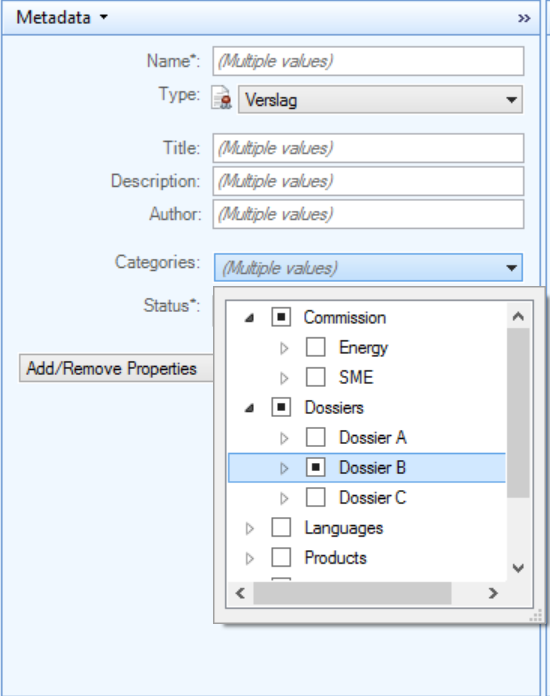 Selecting one of the values will filter the search results to those documents containing that value. The facets pane will be updated to the new search result. The Facet fields and the number of records will be updated to those appearing in the filtered result. 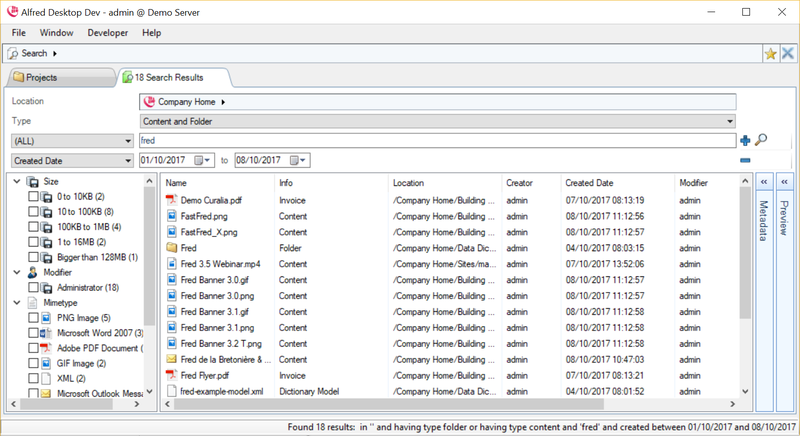 In the example below, selecting “Created Date” filters the search result to all the documents based on created date, and the facet values and the number of hits will be filtered based upon this selection. By selecting multiple facets, you can quickly narrow down the search result to locate the document you are looking for. From Version 5.0 onwards, Alfresco supports SOLR 4.x. This brings with it a new range of facet features. Facets allow you to filter the search result according to the facet value you select. With Alfred Desktop 3.3 or higher, combined with Alfresco 5.0 or higher, you will have facet buckets available for dates and volumes. In text fields, you can use OR, AND & () operators to conduct an advanced search on a specific field. The system administrator can limit the search results on the Alfresco server. Where limits are triggered during the specific search action launched by the user, Alfred Desktop will display a message that additional search results might be available. You can limit the time during which the search is executed, and the number of results that are evaluated, against access rights. If one of the limits set are met, the search ceases and the current result is evaluated against access rights and presented as the final search result. A message is displayed with guidance on how to proceed to obtain a better search result. If you confirm, then the running search will not be cancelled on the server, but the result will not be presented in Alfred Desktop. Instead, Alfred Desktop will present the result of the new search. If you want to limit your search to a part of the repository, you can set the folder in which you want to search. The search will be limited to the folder and its subfolders. You can also select the Favorites folders as a location. You can save your current search by clicking on the star icon next to the search tab, usually in the upper right corner of the User Interface. This enables you to quickly perform the same search again in the future. When you select a document displayed in the result list of a search, the metadata is shown directly in the metadata pane as well as a preview of the selected file. You can group the search results on the values in one metadata field. Right click on the column header and select “Group by”. Remove the grouping by deselecting the metadata field in the list. The search result is shown in a list view. 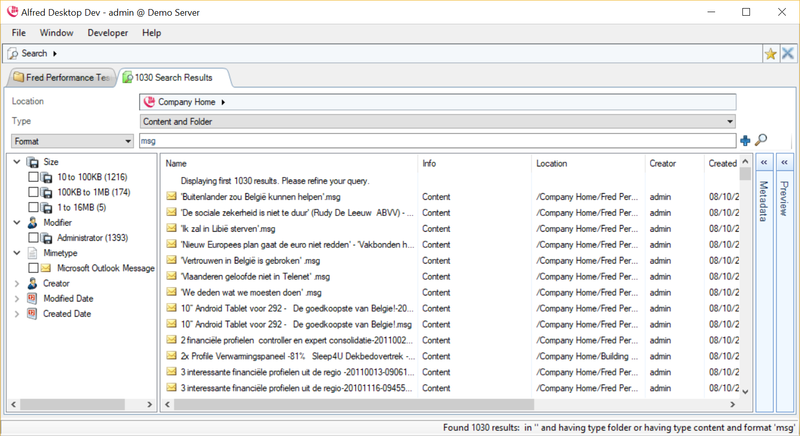 Many of the file commands are available in the Search pane. 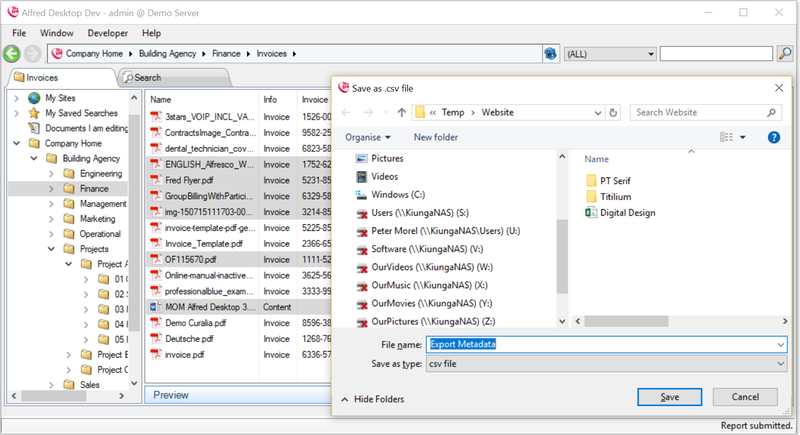 Clicking “Open File Location” will show you the folder or file selected in the tree structure. This will allow you, for example, to find a folder in which you have put a file, and add a new file to the same folder.